Activist and educator Jamal Joseph returned to Pono to meet with the older children. He discussed Dr. Martin Luther King, Jr. and Gandhi, and key moments in the Civil Rights Movement, including the Montgomery Bus Boycott and Ruby Bridges’ role in school integration. Jamal encouraged the children to make a safe space for open discussion and answered their questions. Jamal has many roles as a filmmaker, director, producer, writer, and poet, and we are grateful to him for sharing his time with the Pono children. Ready, set, sniff! Dr. A visited Pono this week for an olfactory lesson with our younger Pono friends. She invited them to close their eyes and try to identify various smells, including fresh basil and lemon thyme, ground coffee, and dirt. The children tasted the basil and Dr. A explained the connection between our senses of taste and smell. Dr. A also showed the children her newest animal specimens, including a raccoon skull and a bat. The older children met with Dr. A this week, too. They discussed the human body, with a focus on illness and cancer. They also enjoyed examining Dr. A’s latest collection of animal specimens. Our summer is buzzing right along and Pono parent and yoga instructor, Eric Stoneberg, guided the children in bhramari, or "bee breath," to help them feel calm and clear headed. Eric's weekly yoga sessions in Marcus Garvey Park are mindful, meditative, and fun! This week our oldest students were exposed to some wacky, brain-teasing math poetry by Langston Hughes, and they learned how to create pauses and rhythmic patterns in their poems by ending lines of text where they want a pause, rather than relying on periods, as we do when writing prose. They also finished reading their book club selection Catwings Return. Our younger literacy group had a treasure hunt for the words said and down, and they learned many words in the ow family. They were also introduced to the words away, find, and little, and had the chance to play word detectives, seeking these words out in several Pono books. Madelyn Zins, our newest big Pono friend, and our young Pono naturalists identified trees in Marcus Garvey Park. The children then collected fallen leaves and made lovely nature-inspired collages in the park. This week in math, Maysaa and the older children worked on place value, creating and writing their own big numbers. They also explored the relationship between addition and subtraction and the relationship between addition and multiplication by working on computation problems. The children were asked to do the computation on their individual arithmetic racks, or to envision the problem on the rack in order to move from using the arithmetic rack to gaining automaticity. Our oldest student studied algebra with math instructor David D'Alessio. Our younger Pono friends read a math story about bunk beds and started a unit that focuses on equivalence and compensation. Our littlest Pono friends enjoyed playing math games. Madelyn and Francesca invited the younger Pono friends to express emotion with their bodies and musical instruments in a movement and music session. Madelyn and the younger children examined seeds, pine cones, and acorns to understand the different ways trees release seeds, and they talked about animals that eat food from trees. The children watched closely as Madelyn added chlorophyll to water to demonstrate how chlorophyll makes leaves green. They wanted the water to get greener and greener! This week in Spanish, Kate and the younger children explored food vocabulary. The littlest friends especially enjoyed practicing Spanish terms with our play food and making “soup” with Kate and Pono intern Lieh. ¡Buen provecho! The older children had a lesson about trees this week with Madelyn. They studied chlorophyll and how trees, like all plants, make their own food. Madelyn and the children also discussed the life cycles of trees and examined seeds and pine cones. We're enjoying summer days with Pono friends old and new! 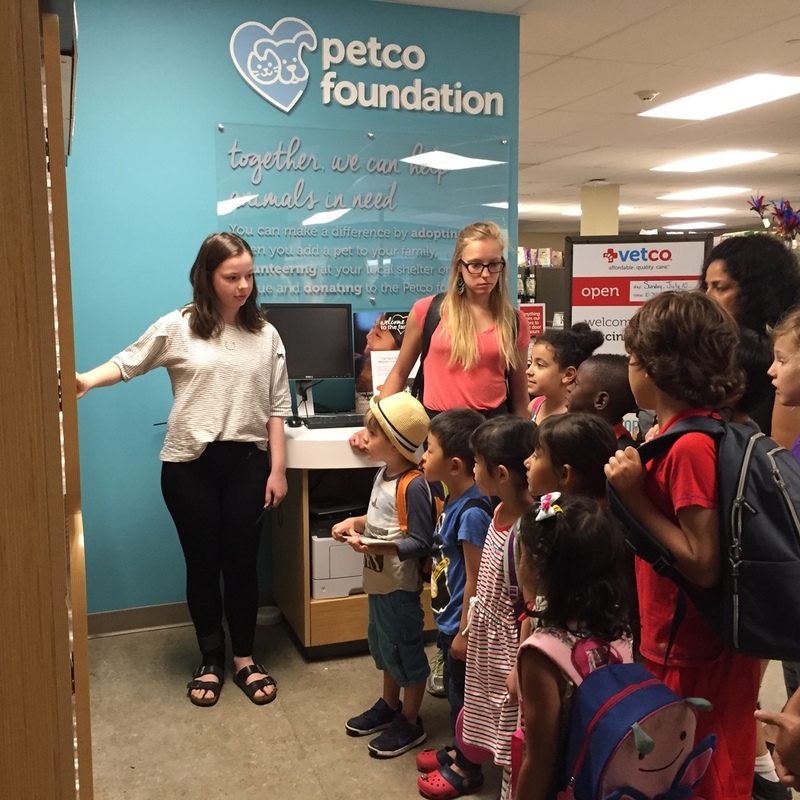 We started our week with a trip to the Turtle Bay location of Petco. Pono intern Francesca introduced us to rescued cats who are available for adoption by charitable organization City Critters. 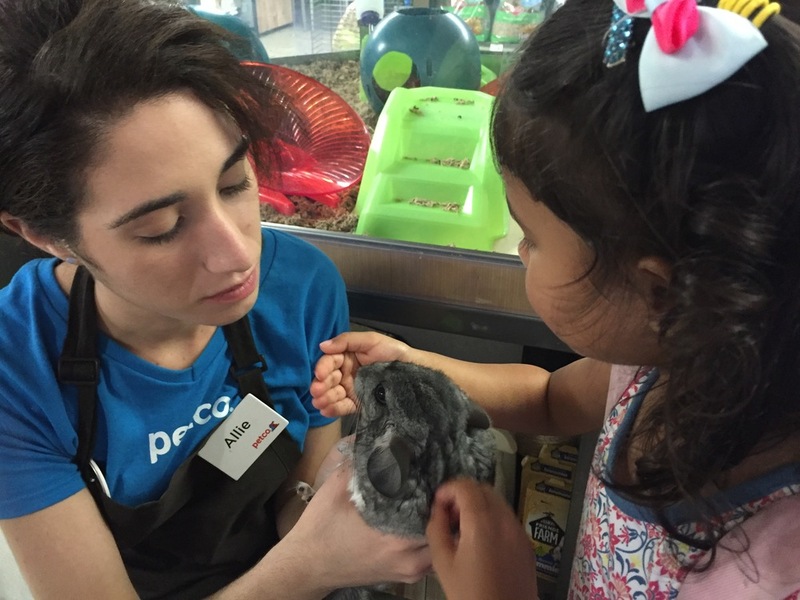 After meeting our new feline friends, Petco employee Allie gave us a tour of the store. We got up close and personal with a number of creatures, including a chameleon, chinchilla, and corn snake. We also asked Allie for her advice on animals that might make a good potential Pono pet. Stay tuned! Later we had lunch in GreenAcre Park, where a 25-foot waterfall provided a beautiful backdrop. We ended our day back at Pono for outdoor play in Marcus Garvey Park. On Wednesday afternoon we headed to Poets House, a poetry library and literacy center in Battery Park City. Suzanne Lunden, director of the Children’s Room, read poetry to the children and encouraged them to think about the poets’ use of language. She also talked to the children about odes and invited them to write their own. We discovered we have a number of Pono poets! On Wednesday we visited Redglass Pictures in SoHo and met filmmakers Tom Mason and Sarah Klein. Tom and Sarah explained different aspects of filmmaking and production, including lighting, using a green screen, and editing. They also shared their experience of filming President Obama and First Lady Michelle Obama for an installation on food security shown at the U.S. Pavilion at Expo Milan. A highlight for the children was making a short video and seeing themselves transported to a tropical locale! This week Julietta and our songwriting and singing team of one re-envisioned her concert, learned lots about popular song structure and lyric writing, and wrote a new song! You'll have to attend the concert to hear this deep composition for yourselves! Bek Millhouse guided our comic book team as they added more details to their drawings. Their characters' heroic adventures are really taking shape!